The Patriot Campers TH610 is the ultimate solution for hauling your big boys toys around iconic Australian 4×4 destinations. Complete with camping essentials in the front, and a 3m checkerplate steel flat bed on the back. 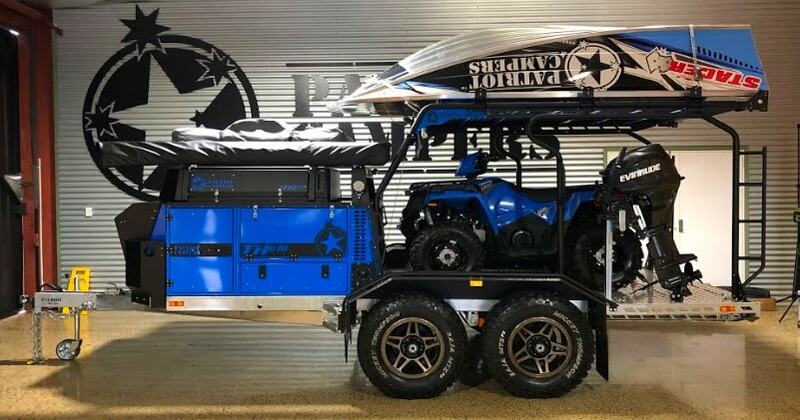 On the back, this toy hauler is designed to carry any combination of your adventure gear, including a full size side by side buggy. Dubbed the TH610, (Toy Hauler 6.1 metre), this trailer truly lives up to its name with all the features and living area of the smaller Patriot X1 up front. With a massive 1.70m wide x 3.00m long deck to accommodate all the toys you would want to take on your adventure.With 2400 litres of internal storage with spaces that allow for bulky items like helmets and boots.The pop-up sits in front and behind it you’re able to haul as many as five dirt bikes, two jet skis, a side-by-side UTV, two ATVs or even an inflatable boat! Patriot Campers list of accessories provide you with a customizable package to suit your individual requirements.Standard fittings include a plumbed sink and fridge slide with storage drawers. The kitchen can be accessed without opening the entire camper making quick roadside meals easy.The TH610 Modular design transforms from touring to extended stays by only using what you require for your particular journey.